Freeman Building Systems believes that quality, completion dates and costs can be firmly controlled by assigning total responsibility for all of these factors to one single entity: the Design/Builder. As your Design/Builder, Freeman Building Systems combines strong construction management ability with experience in balancing good design with outstanding value. Design/Build is a one-stop-shopping alternative that is ideal from your standpoint. You interact exclusively with a single, responsible entity, have freedom in selecting an architectural design, and are assured of quality commensurate with your intentions. 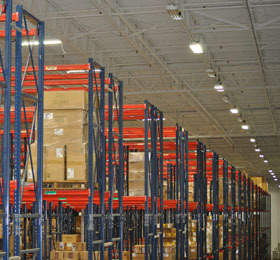 With the Design/Build method, you enjoy the comfort of cost control and schedule guarantees. 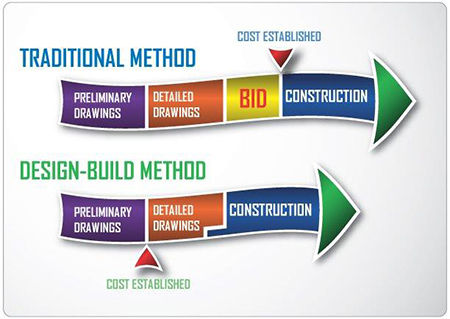 This chart demonstrates how the Design/Build method streamlines the building process and can “fast track” your project. While we’re applying for grading permits and working drawings are being finalized, foundations can be poured and decisions can be made about the building’s interior.